Launch of "Academic Elite Scholarship in Nursing" for full-time undergraduate students. The incorporation of using Virtual Reality Cave Automatic Virtual Environment (VR CAVE) and innovative technological elements including 3D graphics, 360-degree videos and robots in Bachelor of Nursing (Full-time) programme in September 2018. 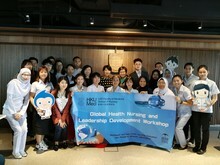 “Global Health Nursing and Leadership Development Workshop” was launched for students from East Asian Nursing Education and Research Network (SEANERN) in December 2018. 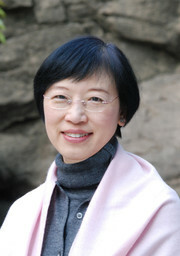 Professor Chia-Chin Lin was appointed to head up the School. Professor Chia-Chin Lin, Head of the School of Nursing was conferred the Alice Ho Miu Ling Nethersole Charity Foundation Professor in Nursing. One of the School’s clinical skills laboratories was named “The Li Shu Fan Medical Foundation Nursing Clinical Skills Laboratory and Simulation Training Centre”. 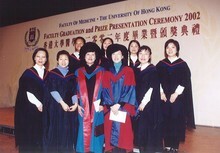 7th Hong Kong International Nursing Forum was one of the important celebratory events for the Faculty’s 130 years anniversary. The School is the only nursing institution in the territory to be a signatory of the Southeast and East Asian Nursing Education and Research Network (SEANERN) Memorandum of Agreement (MoA). 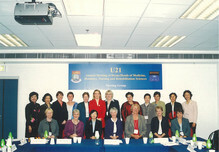 The Consortium for Evidence and Research TrAnslation in Nursing (CERTAIN) was set up. Multiple Mini Interview (MMI) was launched to interview shortlisted applicants for Bachelor of Nursing (Full-time) programme. The first Pinning Ceremony was held. Admission of first student to Master of Public Health(MPH) Intercalated Programme. Launch of "Entrance Scholarship in Nursing" for full-time undergraduate students. Advanced Training Programme in Clinical Nursing Education sponsored by Li Shu Fan Medical Foundation commenced. Standardized Patient Simulation-based Education was initiated. Knowledge Exchange and External Relations Committee was established. 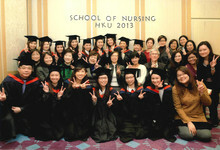 The first cohort of Doctor of Nursing programme graduated. The first cohort of Part-time Pre-registration Bachelor of Nursing (Honours) programme graduated. Undergraduate Research Fellowship Programme was implemented. The five-year, full-time, pre-registration Bachelor of Nursing (Honours) programme commenced in response to the 3-3-4 curriculum reform in Hong Kong. The Symposium on Gender-based Violence in Hong Kong: Sexual and Domestic Violence, co-organized with Department of Pathology and RainLily, was held. The first issue of Nursing Student Newsletter White Guardian was commenced. Professor Agnes Tiwari was appointed to head up the School. The pioneering Temasek Training-of-Trainers Programme for Advancement of Nurses in Guangdong Province, China was completed. The Department was re-named to School. The Part-time Pre-registration Bachelor of Nursing (Honours) programme commenced. Certificate in Infection Control Programme jointly organised with the Department of Microbiology commenced. The Doctor of Nursing commenced. “Family: A Jockey Club Initiative for a Harmonious Society”Project was introduced. The Serena Yang Lecture and the Serena Yang Fellowship were established. 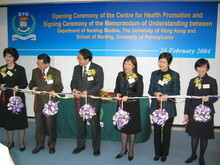 The Hong Kong Nursing Forum was inaugurated. The Serena Yang Scholarship and Prizes were established. The first youth-oriented hotline, the Youth Quitline was established. The 10th Anniversary Symposium was hosted. The Celebration of the 10th Anniversary of the Department. 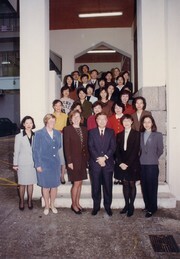 The HKU Nursing Alumni Association was established. The first MPhil student graduated. 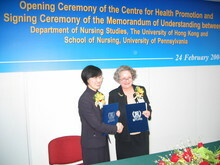 The Centre for Health Promotion was established. 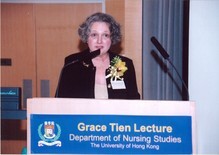 The Grace Tien Lecture was inaugurated. The first issue of School Newsletter was published. The Department responded to SARS. Lau Wing Kai Memorial Prizes were established. 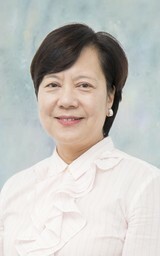 Dr Sophia Chan was appointed to head up the Department. The first cohort of the Master of Nursing Programme graduated. Universities 21 Head of Nursing meeting was hosted. Y W Kwok Scholarship was established. The first honorary tutor was appointed. The first MPhil student enrolled in the department. The Department relocated from Queen Mary Hospital to Sassoon Road. BL Wong Prizes were established. 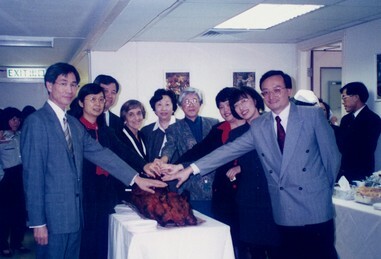 Li Po Chun Charitable Trust Fund Undergraduates Scholarship was established. The first PhD student enrolled in the Department. The first International Nurses Day Health Fair organized by our department. First doctoral student admitted in conjunction with the Department of Pharmacology and Pharmacy. 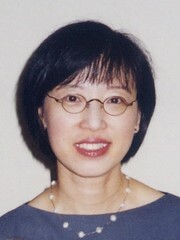 Dr Sophia Chan was appointed to head up the Department (Jan – Aug). 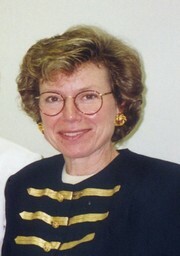 Professor Patricia L Sullivan was appointed to head up the Department in September. The Part-time Post-registration Bachelor of Nursing programme commenced. The Department of Nursing Studies was established. The four-year, full-time, pre-registration Bachelor of Nursing (Honours) programme commenced with the admission of 42 students. 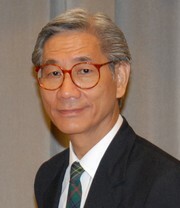 Professor S P Chow was appointed to head up the Department.